Madrid Fusion is a four day extravaganza of presentations, exhibits, demonstrations, food, wine, cocktails and chaos. This past edition, the seventh of its kind, took place at the Palacio Municpal de Congresos between January 19th and January 22nd, 2009. While the events attendees are predominantly Spanish (shocking I know), the event is so widely regarded that live translations are available via headset. As I continue to watch the blogs of those who actually attended, I will post some links as the content continues to evolve. As an aside, thank goodness I took Spanish in high school. While Google can translate basic websites, you are S.O.L. if you are trying to read a pdf or flash page. Luckily, Ms. Comas can rest well. Though it did not come with the greatest of ease, I’ve been able to decode a couple of posts in Spanish. With that, here is the best of what I can gather so far. Both chefs and their assistants performed admirably, especially considering that their dishes were consumed live on stage as they were made by top Spanish critics. 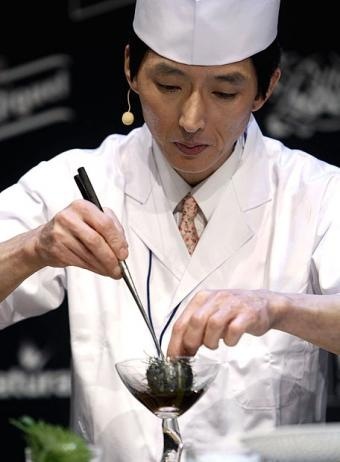 In another comment, I read (in Spanish) “On Wednesday, Japanese chef Kosugi Sotohiro gave a demonstration of his sophisticated Japanese cuisine, which made various preparations with uni.” Sounds good to me!!!! Now for the big news… the REALLY REALLY REALLY REALLY BIG NEWS!!!! While I am waiting on hard confirmation of this: a handful of sources have reported to me that Ferran Adrià, the head chef of El Bulli, plans to stop in at Soto during an upcoming visit to NYC. If that is indeed the case, Soto has just scored major praise. Soto has come along way since his boyhood days in an Iso-Sushi restaurant in Toyama. Congrats Soto and Maho … my hat is off to you! Last I heard, that restaurant is still run by Soto’s older brother.